La nouvelle version (6.0) n’est pas au point et fait regretter la precedent : - L’appli demarre systematiquement en mode en mode portrait (vraiment pas pratique pour lecture sur ipad) - espace ecran perdu apres ajout d’une barre de menu en haut et barre de navigation en bas - Zoom article n’occupe qu’une partie de l’ecran (encore de l’espace perdu) - Pas optimise pour ipad pro 10.5 - Interface kiosque moche Sinon le download plus rapide est appreciable, et la reactivite est bonne. Mais pourquoi tout changer en echange d’ameliorations mineures et de nouveaux bugs? Succession en boucle de messages d'erreur : Disponble... Non, téléchargement en cours... Télécharger à nouveau. Depuis les US et Argentine avec bon wifi. Pas de problème particulier avec l'appli Le Monde. On an iPad2 with AT&T 3G, will not complete loading any issues of the journal. I can get a part of the content, but not all of any one. Frustration. Extremely slow page refresh and frequent crashes on iPad3. Very frustrating. Practically unusable. L'affichage des pages extrèmement lent, et plantages fréquents sur l'iPad3. Inutilisable. You are just purchasing the interface. There is no content that comes with the $0.99. You have to purchase each individual paper / section. Très utile. J'accède rapidement à toutes les infos! Using on iPhone 4. Before, the application stopped after opening the 2nd or 3rd page. Now, it is impossible to complete a download, although Le Monde will still charge you. You will lose your money by using this app. Until a few days ago, I was very happy with this app which I have been using for several months now. I even cancelled my print subscription. But now that I have paid for a full year subscription and updated the app (3 days ago), I am encountering problems uploading the daily editions. It takes forever and I am getting a blank screen! 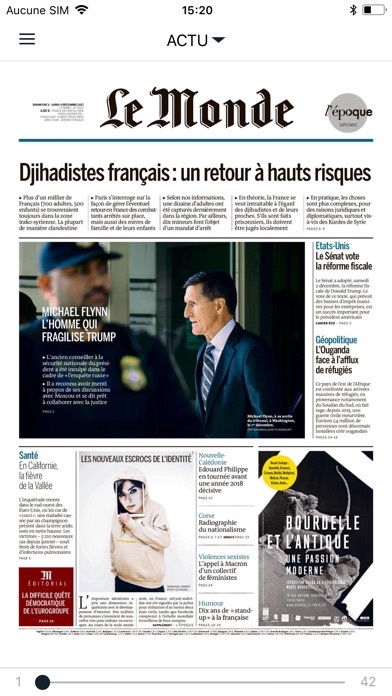 It is impossible to download Le Monde after buying. Please fix it asap. Don't get this if you don't speak French there is no English edition. The app should be free, you have to pay for the app and a subscription. If you want better mowed stick to the American and British papers, they have much better buisness models. It's hard to imagine anything being worse than this. The app runs on both iPad and iPhone, but you have to buy each edition twice, once for each device. When you buy an edition, the immediate response is "an error has occurred, please try again later." At first, you could just tap the edition again and it would download. Now the error seems to be permanent. Oh, I'm sure the problem will be fixed in a week or two, but I wanted to read today's news TODAY! The problems don't end there. I purchased both the May 1 edition and the May 2 edition, only to discover that they were identical and both dated May 2 in the text. When you go to a new page, it takes forever to display. You have plenty of time to go get a fresh cup of coffee between pages. This also happens when you resize a page or move to a different article. Oh, it also refreshes the page at random times, for no apparent reason. You'll be reading along, and the whole screen will blur-out and the excruciatingly slow display starts all over again ... Kerchunk, kerchunk, kerchunk ... Time to go wash the car or mow the lawn. If that weren't enough, the app fails completely at random times. You'll be reading along, and whoosh ... Good bye! The app is just gone. So who did win that presidential election anyway? If this app were my only source of information, I'm sure I'd never find out. Crashes every time when trying to establish an account after paying for the subscription. After paying 17 Euros for the subscription on the app store, I try to enter the fields to create the account. After entering the userid and password, I try to enter the other required fields. The app immediately crashes every time. The subscription money is lost; the app, useless. NOT impressive! 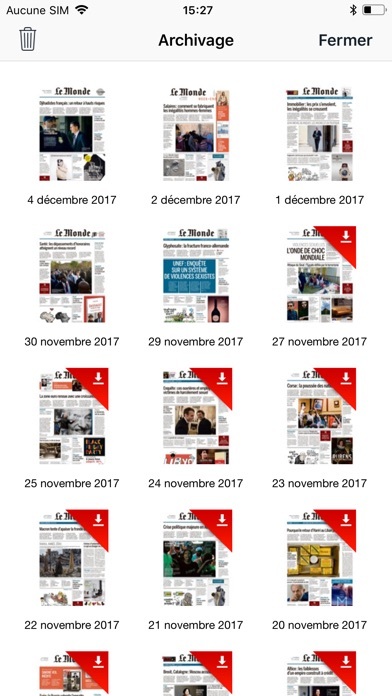 Clarification: This app gives you access to your Le Monde subscription. They give you one free issue but that's all. The app itself is well designed. Only complaint: bad page turning interface. But the economic model is wrong. - Your are paying an app to get to your subscription. Shouldn't the app be free then? - The monthly subscription is 15 euros / month. All the publishers are in hurry to have us pay the full price. But in this modern age, you are not reading only one newspaper, you are getting your info from multiple sources. So if I want to read some articles from Le Monde + WSJ + NYT + Economist + a dozen of other papers, I will have to pay about $200+ a month, or $2000+ a year. We are seeing an old model conflicting with new technology possibilities. This is like being forced to buy a full music album, when you really just want one track. Une seule étoile pour avoir mis 6 mois a corriger votre bug! L'application est essentiellement une version PDF du journal papier. Pourquoi ne pas avoir adapté le format ou profité des fonctions multimédia de l'iPad? Quelle valeur ajoutée par rapport au papier? Application très lente. Navigation difficile. D'autres journaux étrangers sont bien mieux. Très déçue et quand on veut se désabonner c'est très compliqué. Tout à fait est normal, c'est la France. Je le lis chaque jour. C'est l'une des sources les plus objectives de nouvelles. Merci pour cela. Formidable, tout simplement. La gAlere des debuts du journal numerique qui a failli me faire renoncer a mon abonnement alors que jevsuis un fidele lecteur du Monde depuis plus de 35 ans. The app has only crashed occasionally as do all other news apps. The layout is attractive and I find the navigation highly intuitive, though quite different from the NYT and Washington Post. The range of options for navigating and for reading articles is impressive. The ease of accessing the last 30 issues is a great advantage. Le Monde is one of the few great newspapers left in the world. It is reasonable to pay for it and I am glad that a few major papers are now exploring ways to charge for what is fast becoming the preferred means of access to them. The five stars are the least one can say in thanks. Le site ne marche pas très bien sur iPad et personne ne répond pour vous aider. Ne marche pas la moitié du temps. Bugs all the time! Don't get it until fixed! Keep in mind that you have to pay for each issue you want to read, which I did for a while. Not only I takes ages to download but most of the time you can't read the bloody paper as the app won't work at all. Now I'll have to delete the app and lose all the issues I've purchased. I'm French btw but I have no trouble to say that this app is a real shame. Le Monde, you should fire those who've created it, your image is at stake. Amateurs. Update: I gave it another try today...bug again & another .99 p wasted. What's wrong with you people at Le Monde, aren't you just a bunch of "inutiles". Shame on you. The new approach by flipping pages horizontally is nice. Jumping from the index on the left hand side to the content is convenient, but please work on the stability of your app. This is a disaster, it crashes permanently. I keep sending reports, I hope someone take them seriously. This app allows you to BUY single editions... But the eventually disappear leaving you with nothing. I paid and bought additional editions that I had not yet read which are now gone!!! L'installation de ce programme, que j'aime d'ailleurs bien, a ralenti mon "backup" du ipad de manière très significative. It used to be good when reading on my IPad 2, but I thought with the new IPad 3 and its retina display the resolution would be a terrific boost, but the opposite happened!! It is VERY SLOW in showing a clear image of the pages..... Even tough it is previously downloaded , it seems that it doesn't have enough memory to handle the resolution the retina display has to offer. Plus: it crashes constantly. PLEASE HELP!!!! This program will accept your payment for a daily issue, then crash before downloading it. BEWARE. App Le Monde est excellente. Jamais de problemes. I very rarely have any problem with it. It would be nice to be able to flip to the next page in the text mode instead of scrolling down. I just downloaded tne iPad version and it still CRASHES.For 99 cents it's not much better tnan tne free version. You don't have letters to the editor and read the critics. You SHOULD have done a better job! DON'T BUY IT.YOU HAVE TO PAY TO READ ANY ARTICLES. NE L'ACHETTER PAS CELA NE VAUX PAS LE COUP,IL FAUT PAYER POUR CHAQUE ARTICLE.JE VEUX QU'IL ME RENDE MON ARGENT C'EST DU VOL. Tout ce qu'on attend d'un ePaper. Des articles augmentés ou infographies interactives pourraient compléter la qualité du contenu du journal. ... plus d'un an apres sa sortie! You only need this if you're a 15€/month for PDF version. Je suis déçu. 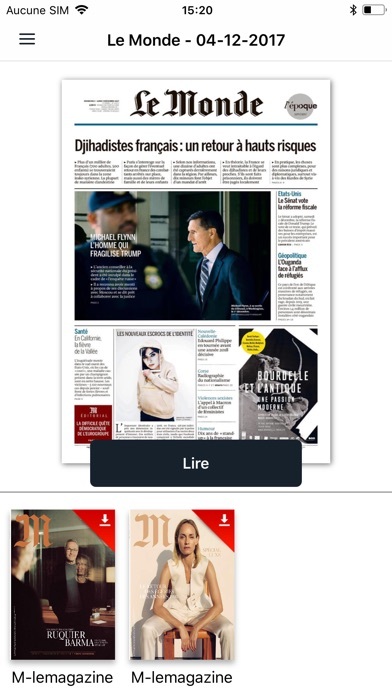 J'aime la commodité d'accéder au journal complet sur l'iPad mais depuis quelques temps, l'application oublie systématiquement mon identifiant et mot de passe (je suis abonnée directement via le Monde et pas via iTunes). L'autre inconvénient, c'est qu'il n'est pas possible de sauvegarder les articles depuis le journal dans le classeur abonné. Il n'est pas non plus possible de partager les articles sur Facebook ou Twitter ou par mail ou message depuis le journal. Je préfère lire la version pdf du journal avec sa mise en page mais la version tactile est Ok aussi. Cannot connect to my subscriber's account. My info is correct; I just get stuck with the spinning loading wheel, then nothing else happens!! Although the initial purchase price is a little high for one free edition, the ease of use and many alternate ways to read the articles make this a great way to read a newspaper. For those complaining about the cost of the each edition have a look at how much the Financial Times charges. I think $0.99 for a paper is reasonable. 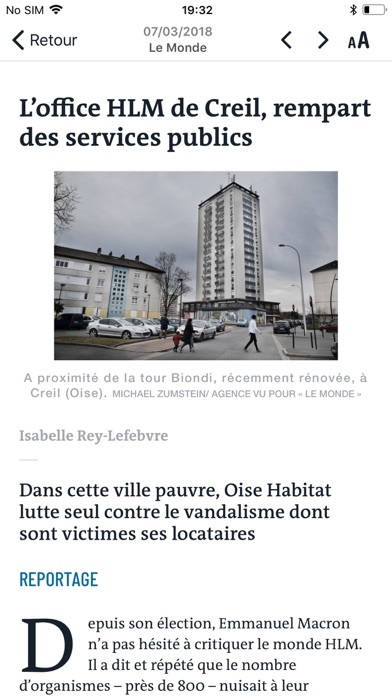 Quel plaisir de lire son journal 'on the go' pour moi qui vit à l'étranger. J'aimerais toutefois voir dans LeMonde des articles propre au format digital, mais aussi des photos, des clips, des vidéos. Un peu plus d'interactivité, des notes de lecteurs, bref un format un peu plus ludique. Franchement ce n'est pas une application, ce n'est qu'un PDF avec aucune experience nouvelle, a eviter autant que possible sauf a vouloir lire le monde en PDF. Ou est passé le journal tactile? After buying the app., you still need to buy a subscription for today's paper. 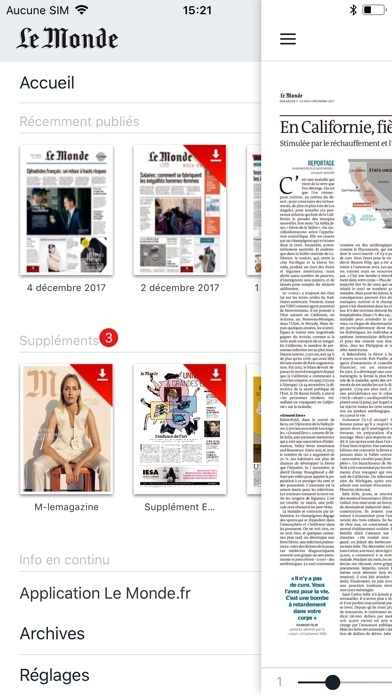 I would LOVE to purchase and read Le Monde through this app - the presentation and content is excellent - but it still will not reliably load content. If I uninstall the app, and then reinstall it, it will download perhaps 1 or 2 issues. PLEASE fix this, so I can be a regular reader of Le Monde! It's unbelievable that such an otherwise excellent app has such a horrible bug. Réparez ce si vous plait!!! World-class content, and the iPhone version works as expected but although I've bought a couple of issues for the iPad as a test (in addition to buying the app itself, of course) I've never been able to download even one, no matter how long I wait while the download icon spins. For now, the free online version is the better option. Impossible le téléchargement. Cette application continue à poser des problème et donc à ne pas répondre au paiement versé.